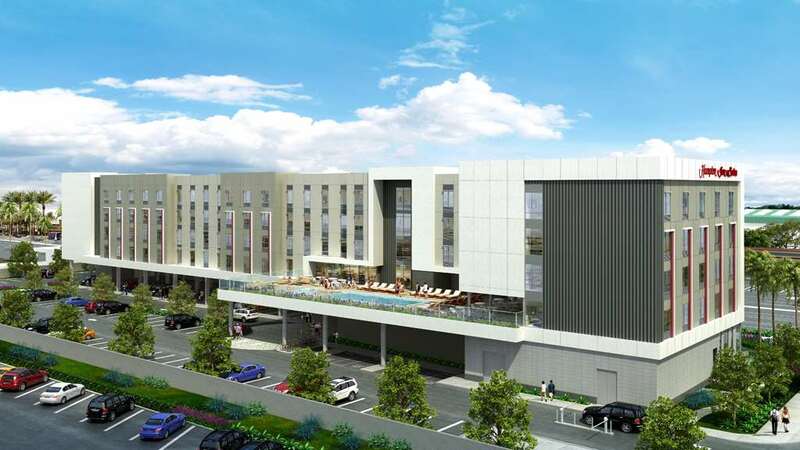 Daily Mandatory Charge will be added to the room rate and includes California Marketing fee Welcome to the new Hampton Inn - Suites Anaheim Resort Convention Center located in the Anaheim Resort area. The hotel is a 5-minute drive to the Anaheim Convention Center and just a 10-minute drive to Disney California Adventure Park and Disneyland Parks. Other attractions like Knott*s Berry Farm Angel Stadium and Honda Center are just a short drive away. Enjoy signature amenities such as Hampton*s free hot breakfast and free WiFi available throughout the hotel. Relax in a modern guest room furnished with a clean and fresh Hampton bed and ergonomically designed work area. Start your day right with Hampton*s free hot breakfast served every morning. Pick up snacks and essentials at our convenience store or enjoy free coffee and tea service in the lobby. Work out in the 24-hour fitness center or swim laps in the outdoor pool. We also have a business center and guest laundry room both open 24 hours for your convenience. Our flexible meeting space offers 576 sq. ft. perfect for meetings and small gatherings. Upscale food court with local vendors - bars in a renovated historic 1919 citrus-packing house. Long-Running family-friendly steakhouse chain known for its ribs onion loaf - romarita drinks.